The great chefs come from around the world for just this competition. Are they making streudel, Peking duck, or chickenalmandine? Heck no! This is real food, good old fashioned American cookin' from the heartland. 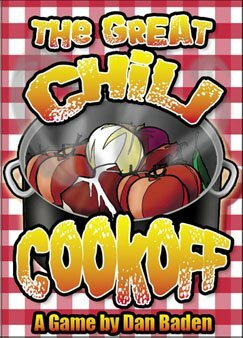 These cooks are here to make some stuff that sticks to your ribs and gives a nice warm feeling to everyone involved, so it's time to see what you can do...it's time for The Great Chili Cook-Off! 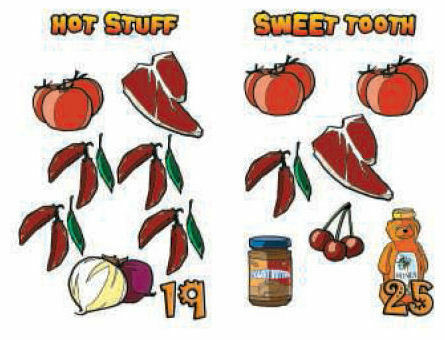 Players try and take tricks to capture the ingredients necessary to complete their secret recipe. Taking a trick requires playing a high card, but if cards are tied, the player who played that value last gets the trick--so there is a HUGE disadvantage in going first.